All of the pages within your website are listed on the left hand side of the page under 'Navigation', 'Online' and 'Draft'. 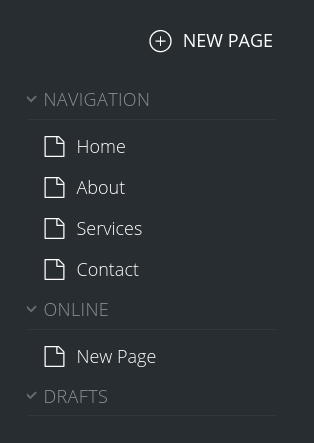 Any pages you add to the 'Navigation' folder will be displayed in your site's navigation menu on the live version of your site. 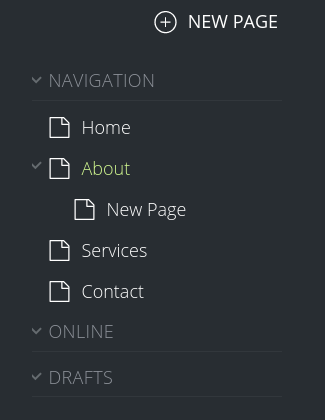 If you add pages to the 'Online' folder, they will be published to the site, but not listed in the site's navigation menu. 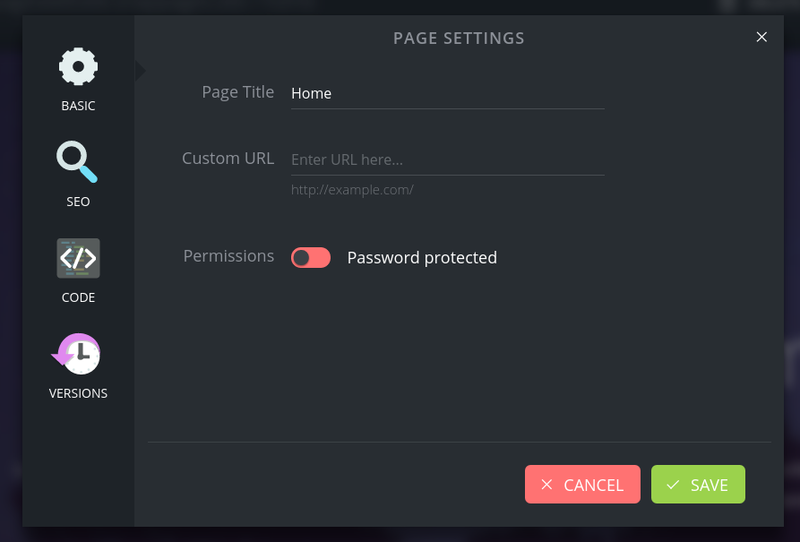 Pages should be added to this folder if you plan to link to them from other areas of your site (or elsewhere on the web), but do not want the pages listed in your site's navigation menu. Lastly, any pages listed in the 'Drafts' folder will not be published to your site and will not be visible to anyone besides you. To move a page around, simply drag and drop it under the folder that you want the page to be added. To edit an existing page for your site, simply select the page from your list of pages and click 'Edit' in the upper right hand corner of the page. After doing this, you will be taken into the page editor. To create a copy of the page, simply click 'Duplicate'. To delete a page, select the page and click 'Delete'. To create a new page, just click 'New Page' located right above the 'Navigation' folder while in the 'Pages' section of your account. To create a drop down menu in your site's navigation menu, simply drag the page you want to be a sub-page and drop it on top of the page you want for it to be a sub-page of. For example, if you want to add a page titled 'New Page' as a sub-page under another page titled 'About', simply drag the 'New Page' and drop it on top of the 'About' page. To access additional options for the pages on your site, select the page you wish to customize and click 'Options' in the upper right hand corner of the page. From there, you will be able to change the title for the page, give the page a custom URL, password protect a page, adjust SEO settings for the page, add custom code to the page's header or footer, and revert to a previous version of the page. If you have any specific questions about any of these settings, let us know! When you create a new page or select and existing page and click 'edit', you will be taken into the page editor. From there, you can make changes to the content for the page you've selected. To read about the page editor in more detail, please click HERE.